If you are receiving this warning and your file size is less than 100Mb then it will be hitting the memory limit. The biggest consumer of both file size and memory is bitmaps within your document. When you import a bitmap, Xara keeps a copy of the full resolution within the bitmap gallery so if ever needed, you can re-import the original image back in. How can I optimise my file? 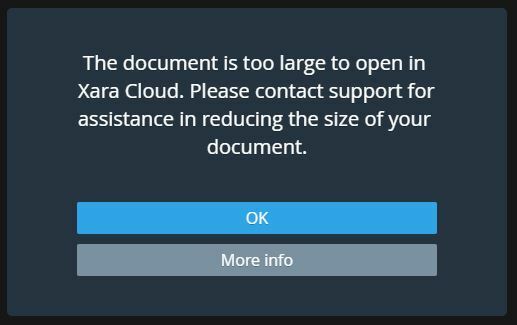 If you are still seeing the warning above then it may be that your file is simply too big to currently open in Xara Cloud.